If you need to add antioxidant protection to your daily life, this supplement may be the one for you. 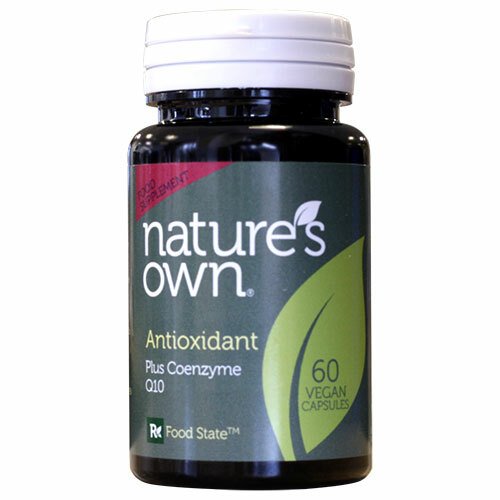 It contains all of the major antioxidant vitamins and minerals, plus Co-enzyme Q10. As you get older, CoQ10 is synthesised less by the body, so your needs increase with age. What do Antioxidant nutrients do? Why might you choose to take extra antioxidant vitamins and minerals? This product can be used in conjunction with one of our regular multivitamin and mineral formulae to elevate levels of antioxidant nutrients during acute needs, or to help build up levels at the start of a treatment programme. This product also contains natural bioflavonoids that support and enhance the function of the vitamin C in the product. Vitamin C (ascorbic acid), Selenium from yeast, Coenzyme Q10, Acerola extract, Beta Carotene (from Dunaliella salina), Vitamin E succinate, Zinc Citrate, Vegetable Cellulose (capsule shell). Take 1 tablet daily as a food supplement, or as directed by a practitioner. Below are reviews of Natures Own Food State Antioxidant - 60 Tablets by bodykind customers. If you have tried this product we'd love to hear what you think so please leave a review. 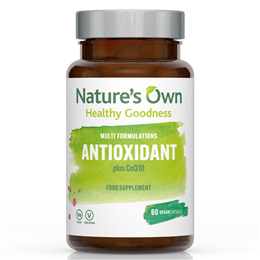 If you need to add antioxidant protection to your daily life, this supplement contains all of the major antioxidant vitamins and minerals, plus Co-enzyme Q10. As you get older, CoQ10 is synthesised less by the body, so your needs increase with age.